Potty Training Accidents. 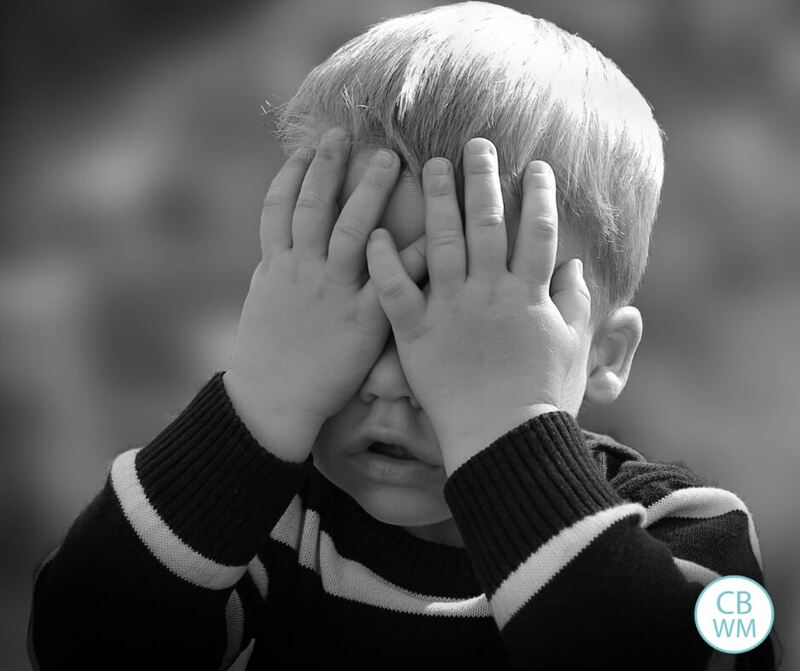 What to do when you face potty training problems. How to handle potty training accidents and why you should be patient. I recently heard an analogy on potty training from Dr. Sears that really made a lot of sense to me. I don’t know a lot about him, but I know that he says plenty of things I don’t agree with; however, I thought this was a great analogy and great advice. He said that potty training is just another skill for your child to learn and expect that there will be accidents. Think of any skill your little one has learned up to this point. Remember when he learned to eat from a spoon? Remember how messy he was? Remember how hard it was for him to get his food into his mouth? Remember when he learned to walk as a baby or pretoddler? Do you remember how often he fell down? Keep in mind that potty training is another skill on your child’s checklist. Just as you wouldn’t punish your child for falling while learning to walk or accidentally spilling food while learning to eat from a spoon, you shouldn’t punish your child for having accidents while potty training. Not only should you not punish, but you should expect and accept that the accidents are going to happen. Just as you would expect a child to fall while learning to walk (an accident) you should expect accidents while potty training. This is one of my favorite potty training tips. When you are toilet training, remember to be patient. Remember when your child is sitting on that toilet or little potty, it is a new skill. Remember when your little one is figuring out how to hold the pee and poop in, that is a new skill. You can expect accidents. As I think of this analogy, I realize how large of a factor age will be in the number of accidents that occur. For example, the younger the child starts to walk, the more often he falls, while the older the child, the fewer falls. Kaitlyn didn’t fully decide to walk until she was 16 months old. By the time she did it, she rarely fell. Within weeks, she was running. I can compare this to Brayden’s potty training. He was pretty old (3) when he was finally potty trained. When we did it at 3, we had one day of accidents. We then had the occasional accident here and there, but it was rare. We will start potty training with Kaitlyn (19 months) soon. She is very ready; however, I expect that the overall process will take longer and that we will have more accidents over the course of training than we did with Brayden because she is so much younger than he was. She physically does not have the same physical control over her body. Mentally, she simply doesn’t understand as much as she will when she is three years old. 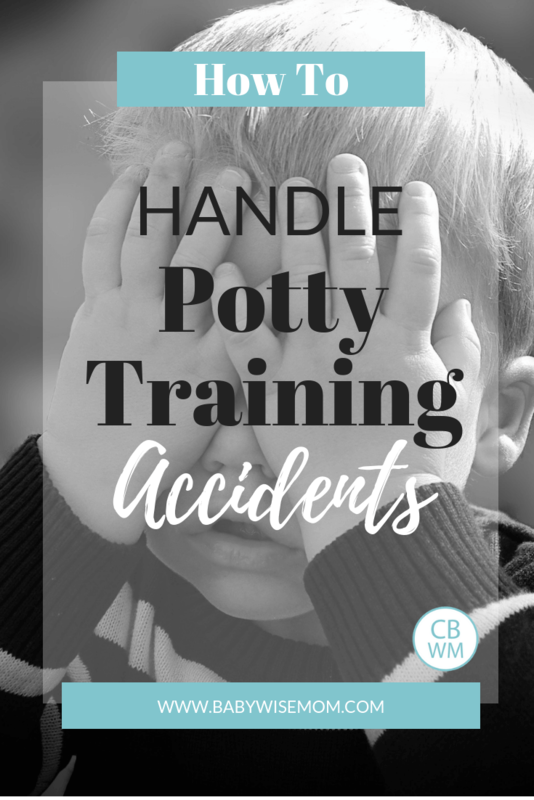 So when you tackle the potty training journey with your child, expect and accept accidents. They are part of the learning process. Don’t get discouraged by them. Take each accident as a learning opportunity for your child. Hi, this is the first time I have read your blog…and I love it! How helpful!! I was curious what your thoughts were on weaning…so I jumped to those posts and found it helpful. However, I have a few questions (sorry it’s not concerning your current post):1. My little girl is weaned from all of her feedings except for the night feeding. Weaning has been pretty easy for the most part except my concern is that she does not like formula or cows milk and bottles, never has! So, for the feedings that should be replaced with formula or cows milk, she is getting water b/c she won’t take milk. Tell me..is this a cause for concern for her calcium intake? I feed her cheese like nobodies business b/c I’m afraid she will not get enough calcium. So what do i do? 2. This last feeding to be dropped…her night feeding. I feed her and then lay her down and she talks to herself for about 5 minutes then falls asleep…so if she won’t take a bottle w/cows milk, do I just feed her dinner as usual at 6 p.m. (whatever we’re eating) and then at 7:30 lay her down without anything? agh…I need your advice. Oh, I think I forgot to mention how old she is…she is about to be one year old. Thanks for your help. Shanks, here is what worked for us when weaning both of our boys,first have you tried the adiri bottle?It is great I found for my nursing babies, it feels just like the breast and they took to it instantly not so with other bottles. The other cup that worked well for us is the Gerber NUK trainer cup it has been great for transition, my 2 year old actually still drinks his milk out of it despite my efforts to get rid of it. The spout is soft and there is handles for them to hold on to.Also I began mixing pumped breast milk with formula/whole milk slowly increasing the latter until it was completely the milk and no longer breast milk. So in the beginning it was 3/4 pumped milk to 1/4 formula or cows milk (at 1 yr it will probably be cows milk) every couple days decrease the breast milk by 1/4 so then move to 1/2 and 1/2 then 3/4 cows milk to 1/4 breast etc. My pediatrician recommended this and it worked very well for us. I thought it would take longer but it only took about a week with my older son and a few days with my younger one. just some ideas, hope they help. I have a 3 yr. old little boy who is brilliant & learns quickly in every area, except potty training! He does well with staying dry, but refuses to poo in the potty! He knows how & knows that he's supposed to do it, he just doesn't care! It seems like we've tried everything! Any suggestions? BTW, I love your blog and so thankful to have found it! lil-rosi, Brayden also had problems. See the blog label Potty training. There are 2-3 posts on pooping in the potty that should be helpful. A little over a month ago I potty-trained my two-year-old daughter. Everything was going great until she developed a urinary tract infection a week and a half ago. Since then she has been refusing to use the potty because it hurt to urinate. The UTI seems to have cleared up, but she is still throwing fits when we ask her to use the potty, and there have been many accidents. I think that she's scared that it will hurt to use the potty and I can't convince her otherwise. I'm at my wits end and today put her back in diapers for my own sanity. Any advice for me? I need help! I had my 2.5 year old boy potty trained at 2 and for the last month and half he has regressed! I have tried going back to prizes for being dry & clean and that didn't work, I feel like I have tried everything. The most frustrating is that he poops his pants and I refuse to clean that up 🙂 He has never really caught on to telling us when he has to go we pretty much have to catch him or watch for his signs, or just take him if it has been awhile. Now when he tells us it is after he has had the accident. What do I do? I can't get it to click with him! Oh and I tried putting a pull up on him and he flipped out, major tantrum. So I told him that if he had another accident we had to put the diaper on, thinking since he hated it so much it will stop him, but nope it continued to happen. please help! thanks! Stephanie, it is pretty common for this to happen. From what I have read, a child grows and the bladder doesn't…it is one of the last things to grow. So the bladder can't hold as much as it once did.I wouldn't discipline and I wouldn't lecture. I would either go back to diapers for night, or get some plastic underwear like people use for cloth diapering. Then if she gets wet, the mess is contained.If she isn't defiant at other times in the day, I doubt she is being defiant about this. Some parents will wake their child up to go to the bathroom before they go to bed. This isn't my favorite solution because it disrupts the child's night sleep. Cindy, what you need to do is try to figure out the reason for his regression. Be sure it isn't a physical thing. He might need to go more often if he can't hold it long enough. I would probably take him every 30-60 minutes for a few days. Then extend it until you find what he typically needs.Be sure to take him first thing after he wakes up, then first thing after each meal. Take him before he goes to sleep. Then throw in other times as needed. Do you have a potty chair he can get on by himself? If not, that might help. Thanks for getting back to me on this. While I was awaiting your reply I came to the conclusion that no discipline was needed, she couldn't help what she was doing in her sleep and she's too solid a sleeper to wake up and ask to go. So we went back to diapers just for night time. Funny thing is, she's now staying dry most nights. Does she just feel more secure in diapers or what could be the difference? Stephanie,That is interesting. It is possible she just feels more secure. Either way, that is good! I really could use some potty training help! My son has benn pooped trained since 18 months and potty trained at 26 months. He is now 31 months. Things are going well except for two things:1) About 80% of the time he will wet his underwear very slightly prior to telling me he has to go. I've have gone back and forth between rewarding him when he is dry, making him go when I think he should as opposed to waiting for him to tell me, disciplining for it, and ignoring or with hopes he will stop soon. I am just not sure what's the best way to handle this! 2) I never stays dry during naps or at night when he is at home. I always put a pull up on. But I just found out that he is staying dry at daycare during his nap (he goes 3 days a week)! It's so common over there for him to stay dry at nap that apparently he's been sleeping in underwear for the past month! I tried to put him in underwear at home- did not work. I've tried talking with him about how if he can do it there he can do it here, showing him a treat he will get, and explaining to call out for me if he needs to go potty. Nothing is working. If he can stat dry at naps there he should be able to at home right? How do I get him to do it at home? LEM, for number 1, I think many of those options are viable. I just wouldn't discipline for it. 2, I would wonder if napping conditions are such at daycare that he just doesn't sleep as soundly. Or maybe the potty is more accessible. Consider what is different between home and daycare–how long are naps at daycare compared to home? noise? light? etc.